This entry was posted in Christmas and tagged christmas, crochet, robin. Bookmark the permalink. I love this Robin. You said you think this was done with cotton thread is this the same as embroidery cotton. 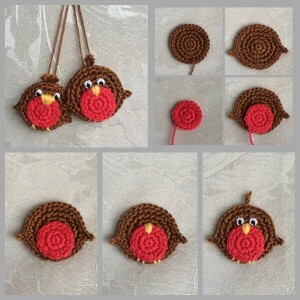 These are super cute little robins and great fun to make! I wondered if you give permission for any that I make to be sold please? OMG I’ve just discovered you – how fabulous are your designs?!?!?!!!! to be honest, I don’t remember. most likely, it’s size 3 crochet cotton thread with 1.75mm hook (or size 5 thread and 1.0mm hook).